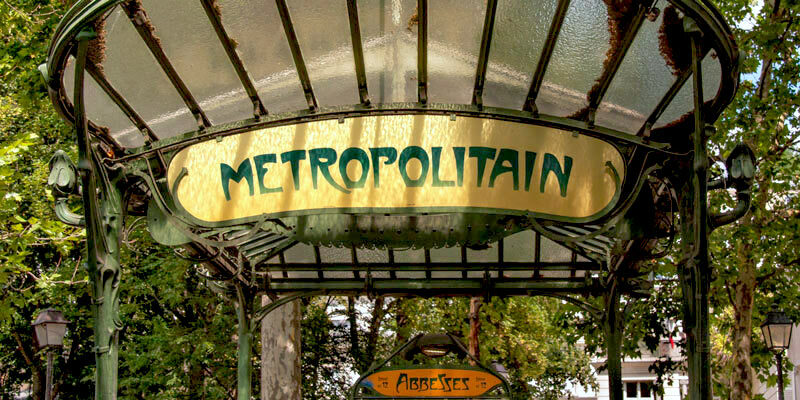 While you're getting around Paris on one of the fourteen Metro lines, be on the lookout for historic Metro stations and their memorable entrances. It's often the little things you remember about your trip to Paris. Surprisingly, unique Metro stations are one of those things for us. It's interesting to note that all three hundred Paris Metro stations are named for people, places, or events significant to French history. 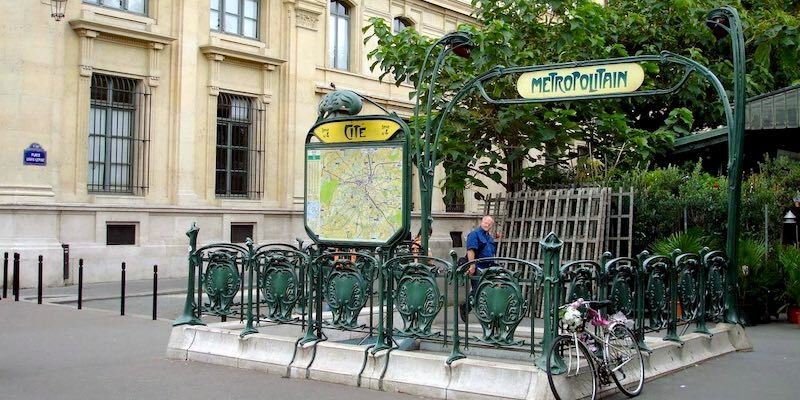 Famed Art Nouveau designer Hectar Guimard (1867-1942) left his legacy with whimsical Metro entrances featuring intricate iron wrought details. 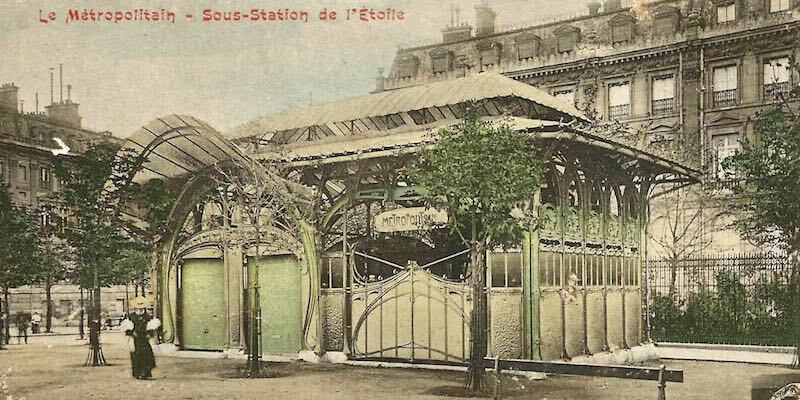 There are only a few of the original Art Nouveau Metro station entrances remaining in Paris — including at Cité, at Blanche, and at Porte-Dauphine. All were designed by Guimard and were completed at the turn of the 20th century, during the period that the Metro system was being built. Note Guimard's use of distinctive Art Nouveau touches like the signature green color, wrought-iron arches, and decorative flourishes. 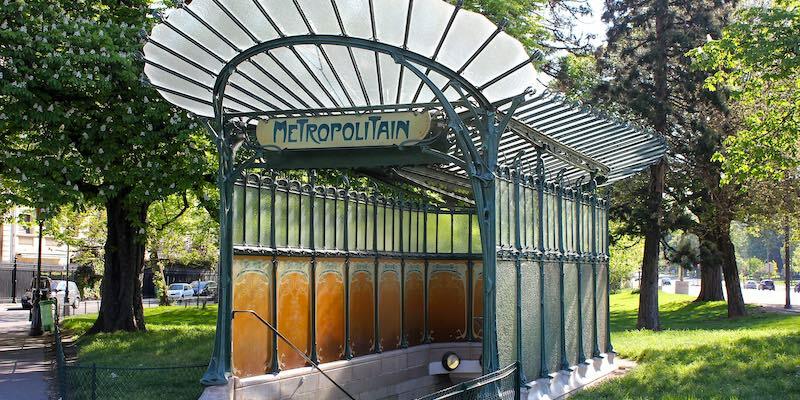 There are still two, and only two, Guimard Metro entrances with their original glass roofs — Porte-Dauphine near Bois de Boulogne and Abbesses in Montmartre. 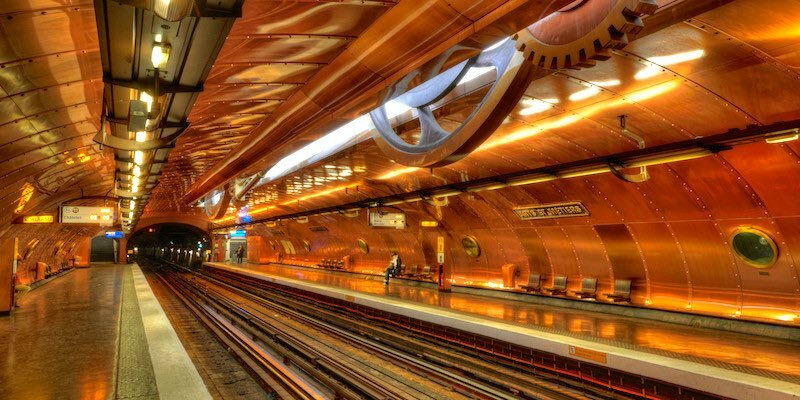 At three hundred feet below ground level, this is the deepest Metro station in Paris. For centuries the Montmartre hill was mined for gypsum, leaving the hill eroded and hollow in places. So, for added security, the Metro had to be dug beneath the warren of tunnels. Today you can either climb the long, winding staircase or, much better, catch the elevator to the surface. The decorative entrance (probably the most photographed Metro station in Paris) was designed by Guimard and features his unique Art Nouveau glass cover. The historic entrance was originally located at Hotel de Ville but was moved to Montmartre in 1970. Restored in 1999, Porte-Dauphine is the second existing Metro station with the Guimard glass top. 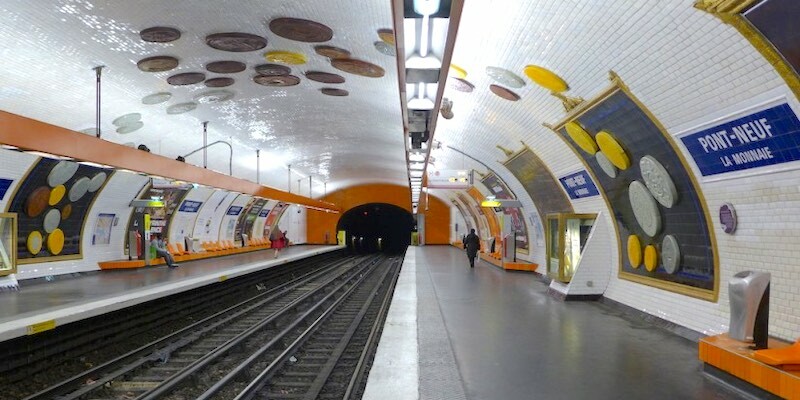 Located near Bois de Boulogne on the western edge of the 16th Arrondissement, the Porte-Dauphine station opened in 1900 and has been been nicknamed "the dragonfly" due to the entrance's light and airy design. One of the oldest Metro stations, Louvre-Rivoli debuted in 1900. 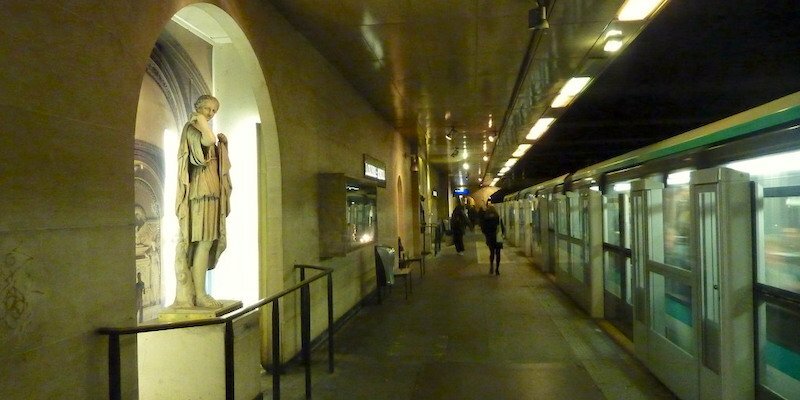 The platform is a museum itself, with softly-illuminated copies of sculptures found in the Louvre. 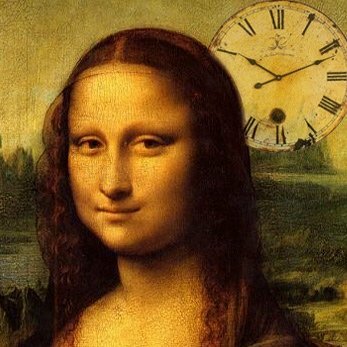 It's no wonder the station's original name was in fact, Louvre. The name Louvre-Rivoli was adopted in 1989 when the new connection directly into the Louvre was opened. Named for the street where it's located, the Varenne metro station opened in 1923 and is the station you choose when you're going to visit Musée Rodin, just around the corner. 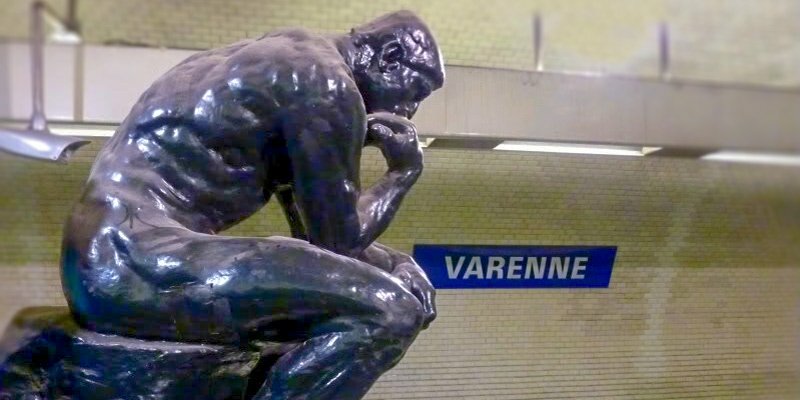 So, it's appropriate that Metro Varenne features two famous sculptures by Rodin — The Thinker and Honoré de Balzac. The oldest Metro station in Paris is found at the intersection of Champs-Elysées and Avenue Montaigne in the 8th Arrondissement. Work here started on October 4, 1898, with men heaving picks and shovels. Fun Metro fact — this station opened in 1900 with two names: Marbeuf and Rond-Point. 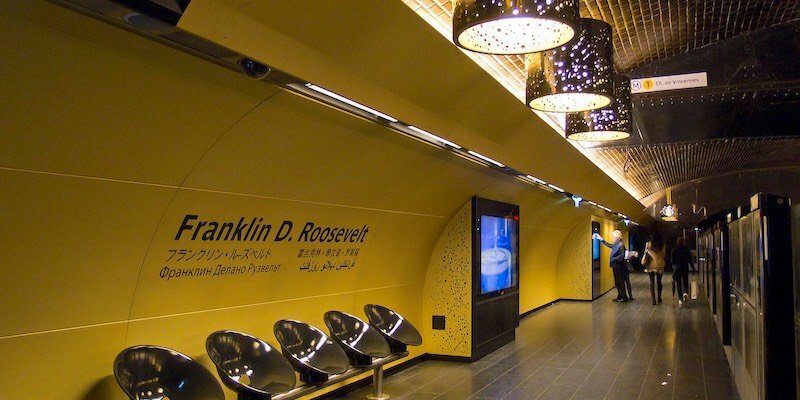 After World War II the station was renamed to honor US President Franklin D. Roosevelt. The station was completely renovated in 2011, giving it a fresh, more modern look with energy-efficient lighting. 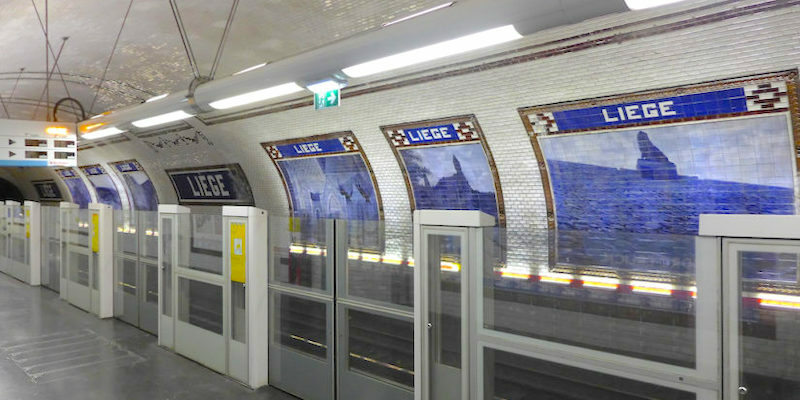 One of the most beautiful Metro stations in Paris is decorated entirely with blue and white ceramic tiles. Originally named Berlin, the station's name was changed to Liège to honor the heroic Belgian resistance during World War I. The station was closed during World War II and did not open again until 1968! And about those blue & white tiles? In 1982, the station was refurbished with the new ceramic tiles made in Belgium, to evoke the landscapes of Liège. This Metro station is named for the Musée des Arts et Métiers that it serves. The station opened in 1904 as the first section of line 3 between Père Lachaise and Villiers. In 1994, to mark the 200th anniversary of the Arts et Métiers national conservatory, the station got a fresh look from François Schuiten, a Belgian comic artist with a steampunk style reminiscent of the kind of contraptions found in the pages of science fiction author Jules Verne. The station looks like the interior of a Terry Gilliam submarine, with copper walls and a series of portholes. Concorde, one of the largest interchanges in the Paris Metro system, links lines 1, 8, and 12. 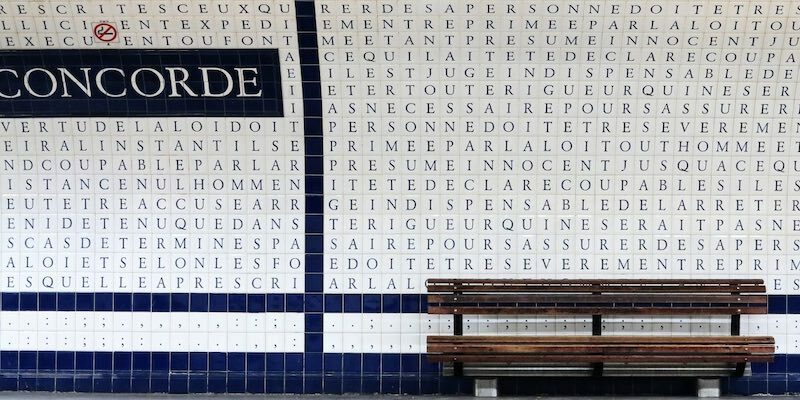 Artist Françoise Schein designed the tunnel with lettered tiles spelling out the entire 1789 Déclaration des Droits de l'Homme et du Citoyen (Declaration of the Rights of Man and Citizens). The game at Concorde is to try and find as many words before the next train arrives. As you might guess, the station serves Place de la Concorde. Cité is the only Metro station on the Île de la Cité, so it's not surprising it is named for the island. 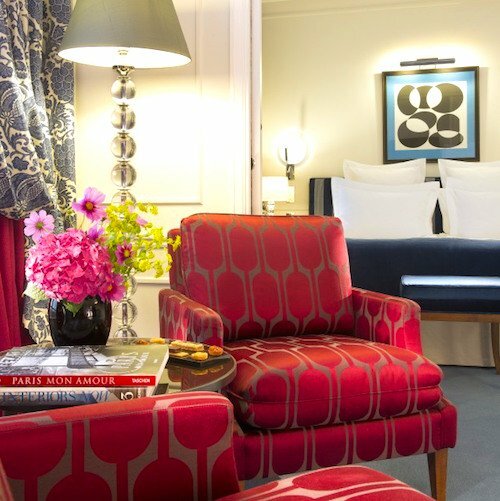 As it's smack dab in the middle of Paris, it's close to many landmarks — Notre Dame Cathedral, Sainte-Chapelle, and the Palace of Justice. You can also see a piece of Hectar Guimard's artistry at the entrance to Cité. Note the curved sign and distinctive hand-drawn font – signatures of the Art Nouveau movement. 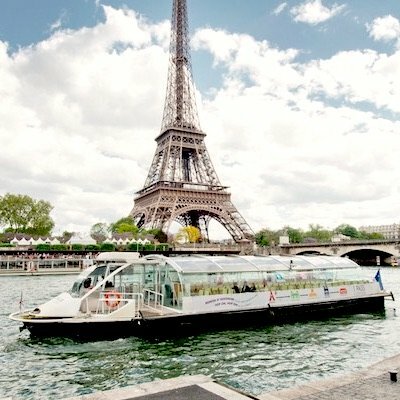 The Metro station is named for one of the oldest bridge in Paris, built in 1607. The theme of the Pont Neuf Metro station is money! That's because the actual Monnaie de Paris (the Paris Mint) is located just around the corner. On the walls of the station are giant replicas of historic French coins. 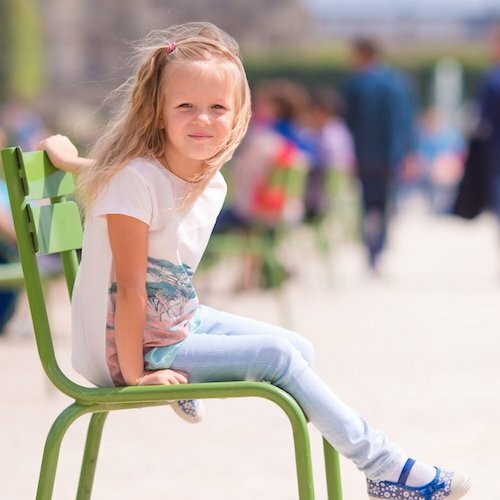 Older than the Pont Neuf bridge, Monnaie de Paris was founded in 864 and is the oldest institution in France. 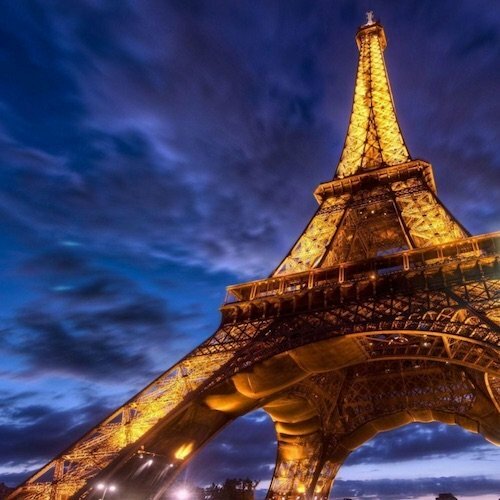 Its purpose is making and circulating coins, including the official French Euro, as well as medals and other official decorations.